Punk Rock Parents: Let the light shine! The Phi has seen 6 different doctors. 2 different pediatricians, 2 different allergists, and 2 different dermatologist. Each new doctor just added a new medication to the mix until I was done. 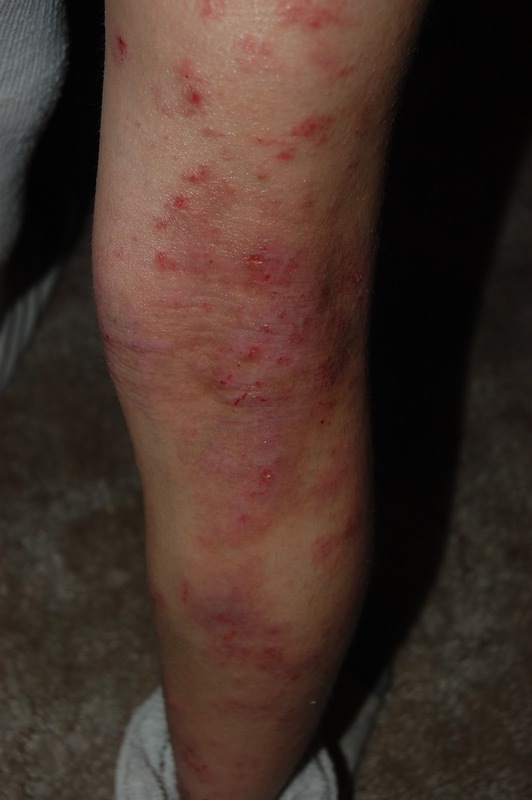 Since she was 2 years old The Phi had been on at least 2 different daily medication and steroid creams daily. DAILY. We are at a point where I can see the side effects of long term exposure to steroids. Her hands are starting to become discolored. Like she has the Michael Jackson disease. 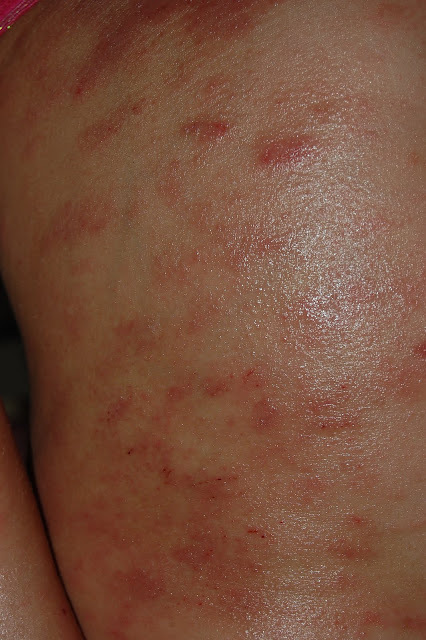 Skin discoloration is a side effect of steroid cream.And everything we have done has not worked. 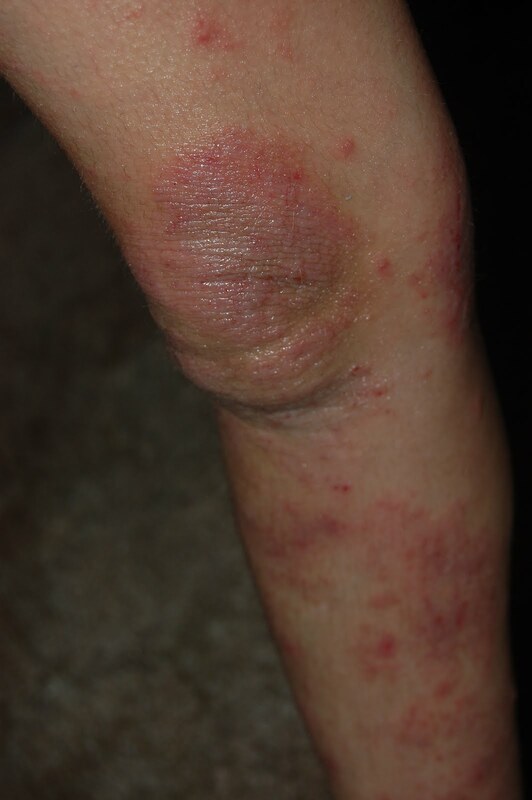 She has been on antibiotics twice for infections due to open rashes. I took her off all medications at one point. And her skin went through the same cycles it did when she was on the medications. To me this was evidence that the medications were not working. Just over medicating her for no reason. The Phi is now at an age where the kids she comes in contact with ask her what's wrong with her skin. It is only a matter a time before the innocent questions becomes teasing. And not to mention the physical pain this causes her. There are times when baths are painful and putting on any kind of lotion is like putting acid on her skin. There are many tears from both her and me. Seeing your kid in pain all day long, watching her scratch herself until she bleeds is awful and Joey and I have been dealing with this since The Phi was about 4 months old. One of my biggest fears when I was pregnant with Louella was that she would have the same skin issues as The Phi. I am very thankful so far her skin is perfect. Today, thanks to her new dermatologist, The Phi is going to be starting Ultraviolet light therapy. She is very nervous about it, and I am still fighting the doctors office and insurance companies about the cost of this. But I am optimistic. I have been wanting to try this for a long time. Ever since I noticed that in Joey's baby book, under medical records there was listed "light therapy for eczema". At this point we are willing to try everything and anything. Wish us luck and send good vibes to The Phi today. Wow. That is awful. I'm optimistic as well, it'll all be ok. Poor little thing. Crossing my fingers for you, that is such a tough thing for all of you to have to deal with. She must be a tough kid. Elisa call me i have a Name of a Dermalogist in oxnard for you that specializes in eczema and psorriasis. Sending good vibes your way!! My daughter has a birthmark stretching all up and down her leg, looks like her veins are showing and her leg is all bruised. I know it isn't the same at all as what you're going through but I relate to worrying about other people, other kids, and more importantly what she thinks of herself. The Phi is a pretty strong kid for dealing with that. I hope the light therapy will work.